Two thousand years ago Romans loved to party. The rulering powers believed the public needed to let off steam. Carnivals and Dionysian feast days marked the calendar. In the fourth century when Constantine announced Christianity as the new religion, a peaceful transition meant holidays needed to stay. Most of the now Western church-related holidays such as Christmas, Mardi Gras, and Easter replaced standing feast days in name only. Mardi Gras, or Carnival, has ancient roots. When early French explorers settled the region known as Louisiana, they brought their homeland traditions. Not Puritans like those settling New England, these raucous New Orleans Roman Catholic immigrants paraded and feasted before the penitential season of Lent. Feast days of Carnival said goodbye (vale) to meat (carne). On the last day before Ash Wednesday, it was time to use up the kitchen’s fat before a sparse and somber Lenten diet. Thus we have Mardi Gras, or Fat Tuesday. In the frugal kitchen of the French housewife, no scraps were wasted. Bits of meat and vegetables went into stocks and soups, and stale bread was saved for French toast, which morphed into the now famous New Orleans Bread Pudding. Who can resist this warm, fragrant dessert that blends the best of a cake, a custard, a soufflé. With some good bread, a few eggs, a little sugar, milk and cream, you can feast like the King of Mardi Gras and find the buried treasure of blueberries in your own bread pudding. In deep bowl whisk eggs with sugar, vanilla, rum, and cinnamon. Blend in cream and milk. Add bread cubes and fold in until thoroughly moistened. Cover with plastic wrap and refrigerate two hours or overnight to allow bread to absorb all custard. 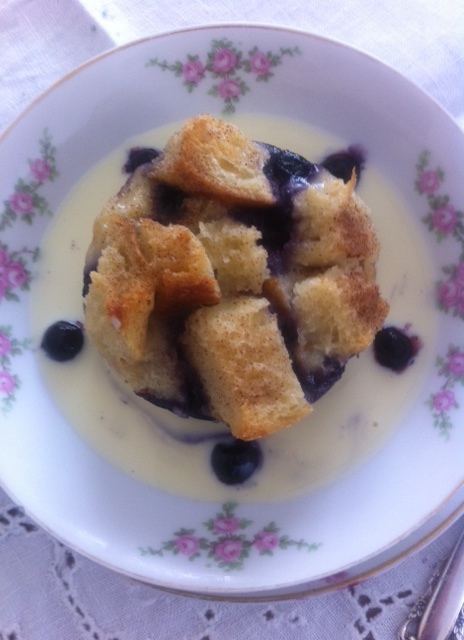 Serve bread pudding warm or at room temperature with crème anglaise, whipped cream or ice cream if desired. Individual servings of leftover pudding may be quickly flashed in a microwave for a quick warm up. You are currently browsing the Mary Jo's Kitchen blog archives for February, 2015.